Quick Heal Total Security is higher-priced than the competition while being slightly less effective at protection. Quick Heal Total Security makes its presence felt the moment it’s installed. On my first day with the antivirus suite it showed me a lot of notifications, and that never really stopped. Personally, I prefer antivirus software that gets to work and doesn’t bother me too much. That’s not Quick Heal’s approach, with its various requests to perform a full scan, several notifications that it has just installed the latest updates, and even an information alert for “6 reasons your computer might be slowing down.” I’m guessing “overzealous security suite” wasn’t one of those reasons. Quick Heal Total Security’s default view. 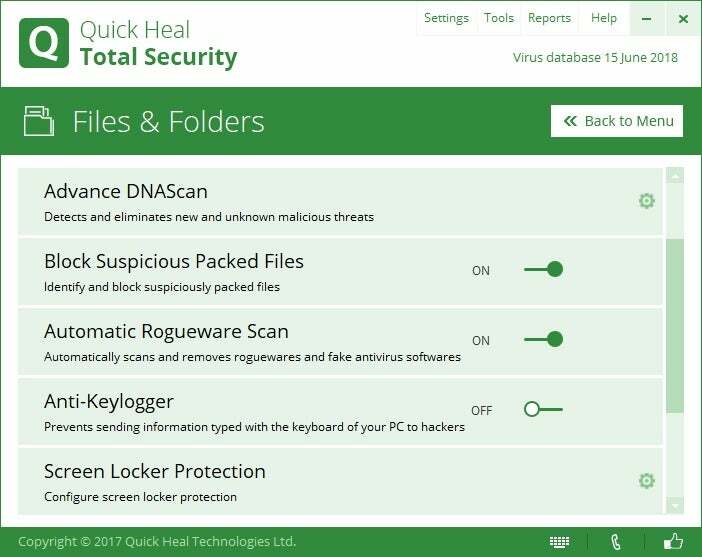 Overactive alerts aside, Quick Heal is an okay antivirus suite that tries to put everything you need front and center. At the top is a large banner letting you know whether the system is secure or if an issue needs your attention. Under that are five category tiles that house all the various settings for Quick Heal Total Security: Files & Folders, Emails, Internet & Network, Parental Control, and External Drives & Devices. What’s odd about these category tiles is that there are five total, but only four appear at one time because the window size is not adjustable. When you want to click the carousel to get to that final tile there are directional arrows, as well as two circles that indicate whether you’re on page one or two. You can click those directional arrows, but not the circles, which is unintuitive. A better solution than all these dots and arrows would be to have a slightly larger default window so that users can see everything at once. Once you dive in to each section, you are confronted with a lot of settings. We won’t go too deeply into them here, but there are a few interesting points worth noting. 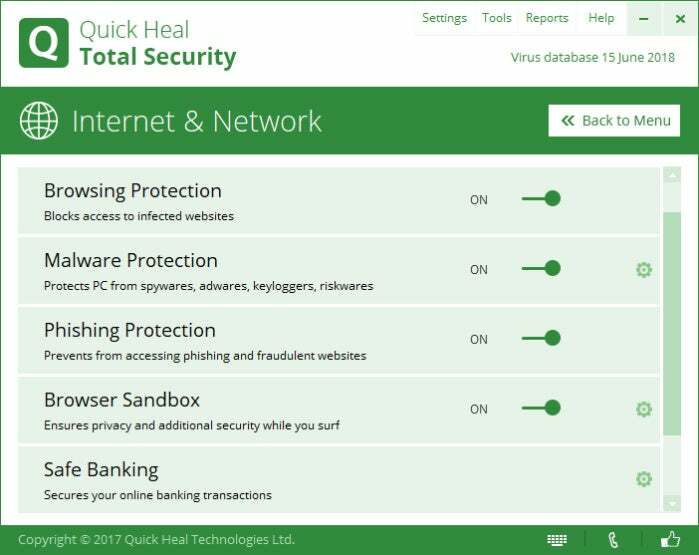 Quick Heal Total Security’s keylogging protection is off by default. 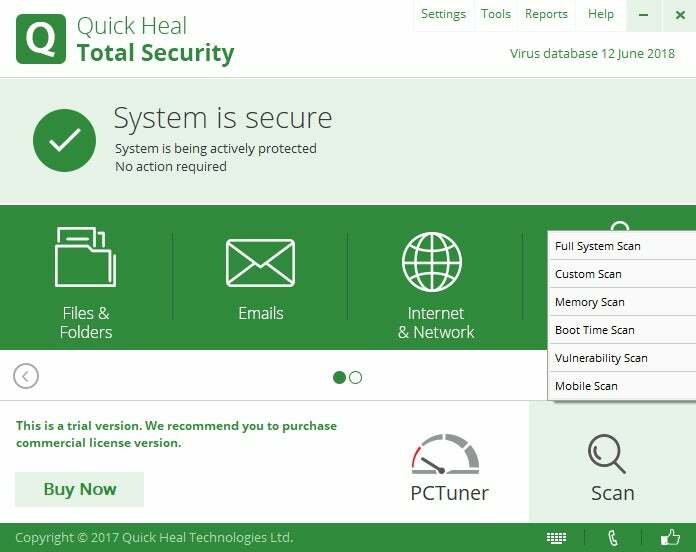 First, Quick Heal offers keylogging protection, which is not turned on by default. Keyloggers are a type of malware that records your keystrokes in order to steal sensitive data like passwords and credit card numbers. To activate it go to Files & Folders > Anti-Keylogger. Quick Heal Total Security’s Internet & Network options. In the Internet & Network section you’ll see a feature called Browser Sandbox, which is off by default. This feature lets you keep your browsing separate from the rest of your system by separating it from the rest of your system. 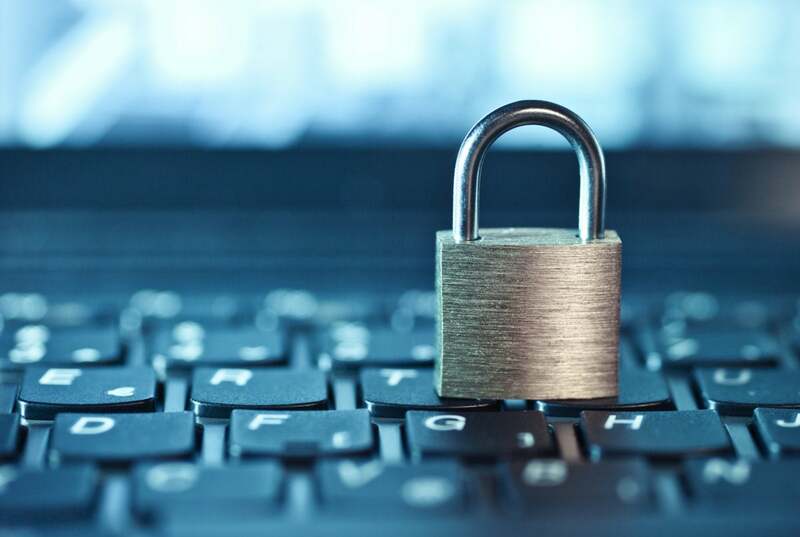 Many AV suites offer a similar feature for banking and online shopping protection, but this is a separate feature for all browsing using your PC’s default browser. You can tell it’s on when your browser is surrounded by a bright green border. Finally, External Drives & Devices > Data Theft Protection allows you to prevent users from copying data from your PC to an external USB drive. With this feature there’s an option to allow read-only access to USB drives. When this setting is active Quick Heal allows you to see and use the data on the USB drive, but you can’t copy information from the PC to the drive. There’s also a block everything option, as well as the ability to authorize specific USB drives for full access. Everything else you’ll find in Quick Heal is fairly standard for security suites. Though advanced users could have a field day tweaking these settings to their heart’s content. On top of all that, there’s also a Settings option in the upper-right corner. This is specifically for the Quick Heal application. Here you can turn off automatic updates and set a password for access to the app. Next to Settings there’s a Tools menu option where you can create an emergency disk for cleaning out heavily infected PCs, as well as an antimalware cleaning utility. Quick Heal Total Security’s PCTuner. Moving down to the lower-right corner of Quick Heal Total Security there’s a Scan icon where you can run your choice of a full system scan, custom scan, memory scan, boot time scan, and vulnerability scan. To the left of Scan there’s a PCTuner option that houses the usual tweaks for cleaning up your PC such as disk and registry cleanups, and a disk defragmenter. Quick Heal’s PCTuner operates as its own mini-app that launches in its own window. One nice differentiator to PCTuner is a duplicate file finder under PCTuner > Tools. If you have a ton of duplicate photos, for example, you can use this tool to find them and save on disk space. 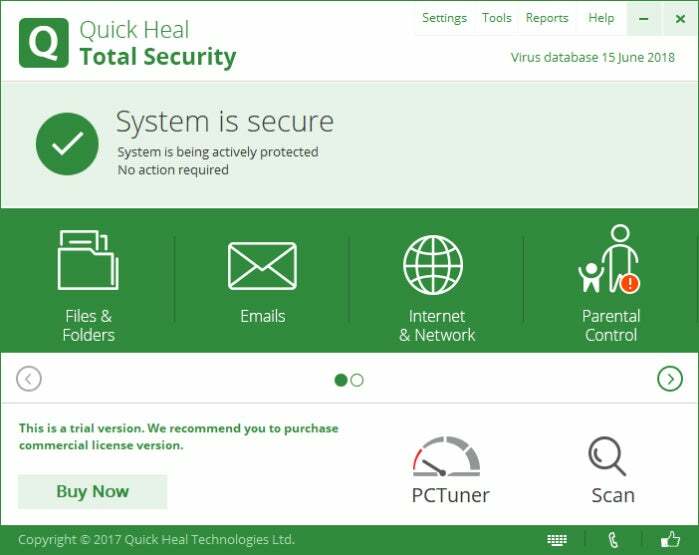 Quick Heal Total Security is priced at $74 for one user for one year. If you need more protection than that, there’s also a multi-device option that costs an extra dollar ($75) to protect three devices for a single year. That is a really high price considering the industry standard is $100 to $110 to protect 10 devices for a year. There are also deluxe security suites with far more extra features than Quick Heal such as secure cloud backup and encrypted file vaults. AV-Comparatives is the only testing house that’s looked at Quick Heal in recent months. During the testing house’s real-world protection test in July 2018, Quick Heal had a 100 percent blocking rate of 186 test cases. Quick Heal had just four false positives, and a compromise rate of zero percent. In the March 2018 malware protection test Quick Heal had a 99.7 percent protection rate with 16 compromises and 8 false alarms against more than 20,000 samples. That’s one of the lowest scores in this test—not one antivirus suite in the test group scored below 99 percent. Quick Heal Total Security’s scan options. As for our in-house tests, before Quick Heal was installed the test PC scored an average of 2,414 in PCMark 8’s Work Conventional test. After Quick Heal that number improved to 2,438. That’s a nice little bump and quite common in these post-Meltdown and Spectre days. In the Handbrake test there was little change with the PC able to re-encode a 3.8GB HD MKV file with the Android Preset in an hour and 15 minutes before Quick Heal and one hour, 15 minutes, and five seconds afterwards. Quick Heal has a usable interface, and a whole lot of settings to tweak, but the protection scores are not as high as other competitors. On top of that it’s expensive at $75 for three devices. There are simply better options out there with more value for your money than what Quick Heal offers.